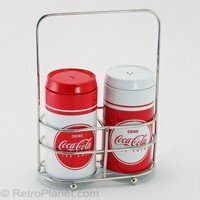 Metal salt and pepper shakers and carrying caddy imprinted with a vintage Coke advertisement. Shakers are approximately 5" tall. Officially licensed Coca Cola product Manufactured by The Tin Box Company.